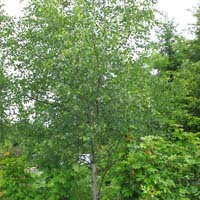 Paper birch is known for its white, peeling, paper-like bark that is found in mature specimens. The bark is dark in young trees. It has a smaller, more delicate appearing leaf than alder and can look nice planted in groves.